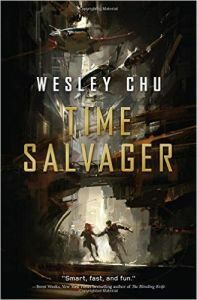 I do like the cover art on Wesley Chu’s ‘Time Salvager’. It’s like one of those slightly blurred oil paintings and is very minimilastically atmospheric. It gives a good impression of the dystopian future that James Griffin-Mars lives in, where the atmosphere and the oceans are polluted and the cities are crumbling to ruins.